Dr Michael Timms is an education researcher specialising in the measurement of learning in interactive learning environments. He has a background in the development of high quality assessments and educational measurement in a range of settings. 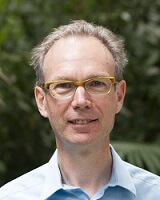 In 2005 he was awarded a PhD in Quantitative Methods in Education from the University of California, Berkeley. He joined ACER in 2011 as Director of Assessment and Psychometric Research. He has twice received the Paul D. Hood Distinguished Contribution to the Field Award for his involvement in the development of assessment frameworks for the US National Assessment of Educational Progress, in 2006 and 2009. In 2013 he received the Journal of Research in Science Teaching Award from the National Association for Research in Science Teaching (NARST), a worldwide organisation for improving science teaching and learning through research. Dr Timms is interested in how to track and support learning in interactive learning environments. As co-principal investigator on the SimScientists research programme at West Ed in the United States, he designed and implemented a system of formative assessments using simulations for middle school science students. His studies have show that simulation based assessments can be valid and reliable, and that they provide valuable support to students whose first language is not English as well as students with disabilities. Currently, he is working on a project called Voyage to Galapagos, funded by the US Department of Education, which is investigating the optimal way of supporting student learning in an open learning environment. He is interested in when to provide feedback to students and the best format of feedback to provide. How well different students receive and use this feedback is also an area he wishes to explore.